Wednesday night’s Scotia Festival concert in the Sir James Dunn Theatre exhausted the attentive listener with, among other things, exhilaration. The big piece on the program was a transcription for string trio of the Goldberg Variations, one of the keyboard repertoire’s all-time masterpieces. It’s a funny thing about Bach. His music is at least as good as a cup of strong coffee in energizing you for the start of your day. Pablo Casals, the legendary cellist who first brought the Bach Cello Suites into the performance mainstream, used to play one of the 48 Preludes and Fugues on piano before breakfast every day. If you are tired, playing Bach can pick you up. Afterwards may be a different story. Often you just collapse. Violinist Jonathan Crow, violist Douglas McNabney and cellist Matt Haimovitz played the poignant, house-hushing aria that starts and ends the set, and all 30 astonishingly inventive variations between, straight through in the first half of the concert. It took somewhere between the 38 minutes of Glenn Gould’s 1955 landmark LP recording, and his second recording (1984) at 51 minutes. At a guess, I would say it was nearer to the earlier version. The trio’s tempos redlined within a hair of impossibility several times. The string version is extremely intense for the listener. The three-part counterpoint is so clear and the interaction so brilliant, you hear things in the work that only players usually do. Afterward, your ears feel like your leg muscles do at the end of a 40-minute run. The brain boils. The same trio of musicians has recorded this music; the CD is available in the Scotia Festival office in the Dalhousie Arts Centre (Room 401). After the intermission, violinist Mark Fewer and pianist John Novacek played Four Rags, all composed by Novacek in both a kind of tribute to Scott Joplin and the other classical ragtime pianists, as well as an original exploration of the harmony and figuration. No doubt Joplin, who always wrote in a box at the top of his piano parts, “Ragtime Should Never Be Played Fast,” would have hated it. On the other hand, he was a musician, and no musician could hate what Fewer and Novacek did to the form. It was a hoot, the ultimate party music, juiced and revved up and totally in your face. The first (Intoxication) lived up to its name, with Fewer attacking the violin part furiously, and Novacek aiding, abetting and cranking it up a notch at every opportunity. Next came 4th Street Drag, slow and sensuous, then Cockles in a high-minded novelty style, and the set ended with Full Stride Ahead, a steam-engine of a piece, with Fewer bobbing and weaving and Novacek jumping up and down on the piano bench. Great fun. For the final work on the program, Novacek switched Fewer for violinist Elmar Oliveira and added cellist Haimovitz to play Mendelssohn’s Trio in C minor, Op. 68. It began with fairy music and ended, as it mostly continued throughout the four movements, in a full orchestral treatment, all three instruments playing virtually all the time, with no one stepping away much from the spotlight to accompany. The audience, though they must have been a little worn out by now, called them back repeatedly for several bows. They didn’t really expect an encore (that would be cruel). They were just out of their minds with happiness and gratitude. 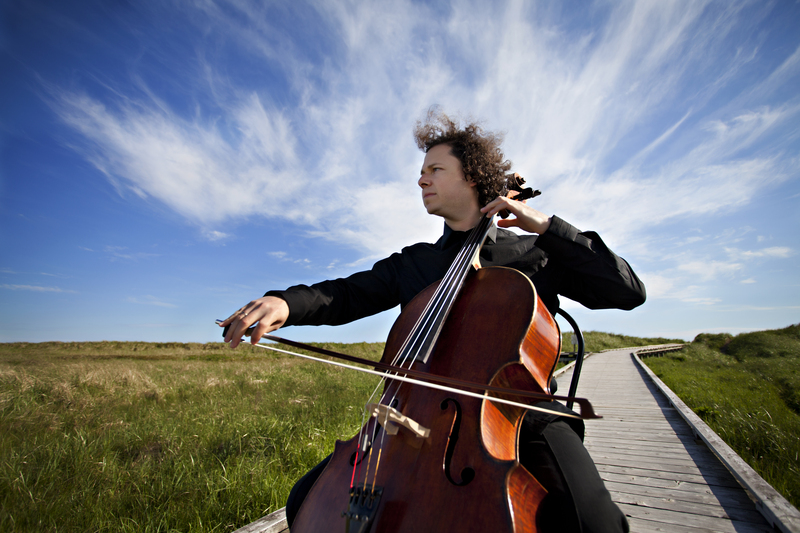 ← The Halifax Herald: Cellist Matt Haimovitz is a loner. Musically he goes his own way.